I’ve spent a lot of time debunking class-warfare tax policy, and I’ve certainly explained ’til I’m blue in the face that big government facilitates a pernicious form of corruption that enriches powerful and well-connected insiders. But I haven’t spent much time addressing the topic of income inequality, which is connected to those two other issues. U.S. News & World Report just weighed in on this issue, citing a leftist video designed to build support for redistributionist policies. Occupy is by now forgotten (if not gone), but the top 1 percent came roaring back into view this week with a viral video that has been seemingly inescapable for anyone on Facebook or Twitter. The slick, graph-heavy animation shows the results of a 2011 study that found not only that Americans vastly underestimate wealth inequality in the U.S. but that current inequality is very far from what most Americans see as ideal. I contribute to the discussion, making the point that people should focus on the source of inequality. …some would argue that not all inequality is created equal. According to one expert, the problem is far worse when it’s a function of bad government than when it’s a function of private industry growth. “If you’re a very corrupt, cronyist type economy like Argentina or Mexico, you have a huge degree of income inequality and it’s driven by the fact that the elites control the levers of power,” says Dan Mitchell, a senior fellow at the Cato Institute, a libertarian think tank. Meanwhile, a less-corrupt, high-inequality, but fast-growing economy–Mitchell uses the example of Hong Kong–might be healthier, more stable, and more likely to have a rising tide of growth lifting all boats, even if it’s lifting some boats more than others. In other words, as long as everyone is benefiting, albeit to different degrees, he says, that’s one key test of whether inequality is “good” or “bad.” …As for the question of where U.S. inequality is coming from, Mitchell says he fears that corporate influence in Washington may be creating inequality of what he might call the Mexican or Argentinian type. That is, he believes that big banks and healthcare companies are skewing the system in their own favor via legislation like Dodd-Frank and healthcare reform. To get an idea of what I’m talking about, check out this chart comparing economic performance in a nation with capitalism, a nation with cronyism, and a nation with statism. 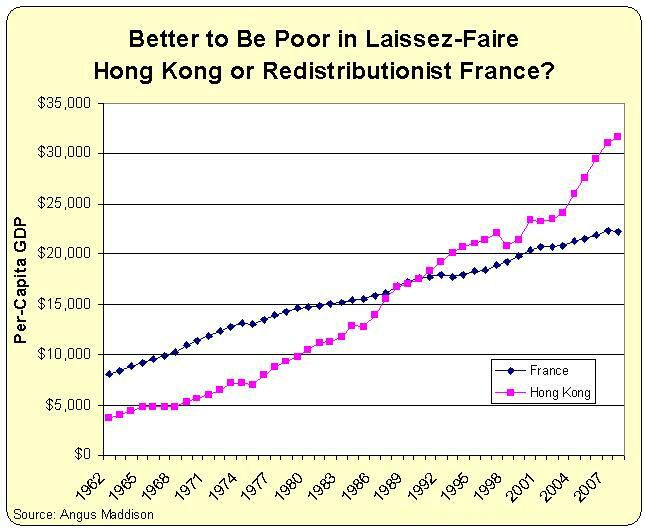 And since I specifically cited Hong Kong, check out this chart. And click here to see how Argentina has fared with a system where government picks winners and losers. The article then follows with a sentence that may be true as a political prediction, but completely misreads the point I was trying to make. If that’s true–that those at the top are able to entrench their places at the top, at the expense of others–it is reason to angrily hit the share button. NO!!! What I’m pointing out is that we should repeal laws such as Obamacare that promote cronyism and corruption. But that’s not the only argument against the leftist argument for redistribution. My former grad school colleague, Steve Horwitz, makes the key argument that it is shoddy to compare changes over time for income quintiles without also measuring income mobility. And you can click this link to hear what one of my professors from grad school, Don Boudreaux, had to say about the notion that wages have stagnated. if you want even more, here’s something I wrote on income inequality and here’s a debate I did on income mobility. Even better, here’s what Margaret Thatcher said about these topics.